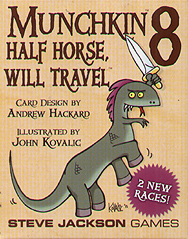 These two classic fantasy races get the Munchkin treatment in Munchkin 8 - Half Horse, Will Travel! Plus new Race and Class Enhancers: you can be Elite, Legendary, or Elder! Go for all three... you'll need all the help you can get when you fight That Gecko On The Telly, the horrifying Centaurpede, and the dread Knight Mare! This is an expansion for Munchkin. it is not a stand-alone game.